There are few live recordings which really capture performances successfully. This is one of those. 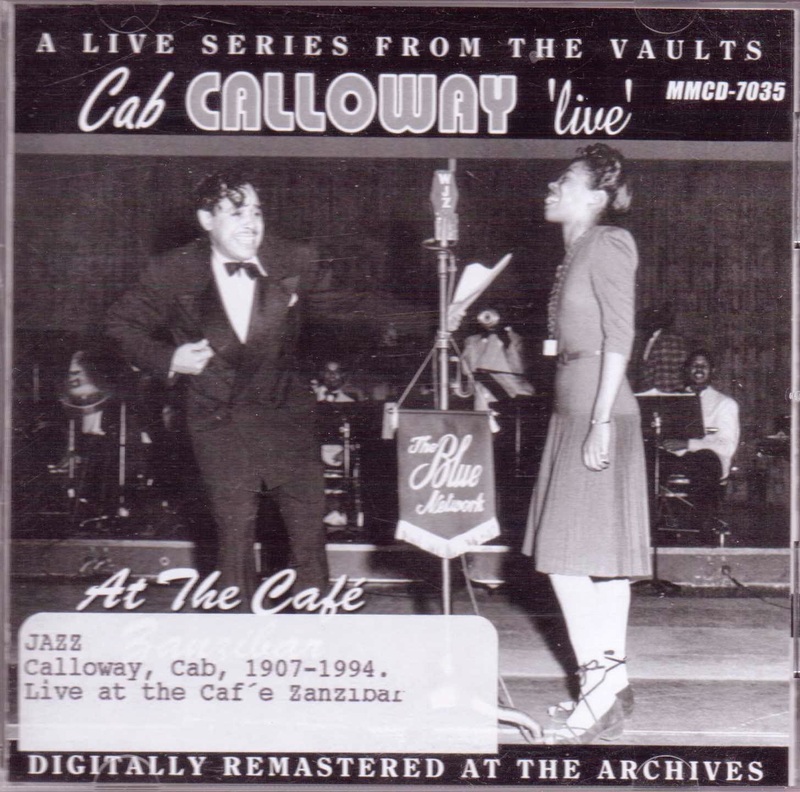 Recorded at the Café Zanzibar in New York City this collection of some of Cab Calloway’s greatest live musical performances seem to come to life. The closest thing to the live energy captured on this disc would probably be James Brown Live at the Apollo, which was recorded in 1962. And although it is recorded in mono the re-master of these numbers is flawless. These are not the songs most people think of right off hand in connection with Cab Calloway at the Cotton Club, which had closed just a few years before this recording was made at the Café Zanzibar. In many ways the Zanzibar came to replace the Cotton Club as the musical Mecca in midtown Manhattan at 49th Street above the old Winter Garden. Originally called the “The Frolic” the club had such a bad reputation that most performers at the time referred to it as a “jinx joint.” All that changed on July 1, 1943 when the club opened under new management with Ella Fitzgerald headlining the first show. The new club also had a stated policy of hiring the best of the African-American performers of the day. Louis Armstrong, Count Basie, The Mills Brothers, Pearl Bailey and even Bill Robinson were regularly featured stars. These were the days when the white folks would see the show at the Zanzibar and go home by about 2 AM. That’s when the performers headed back uptown to Harlem where they swung the rest of the early morning hours away at the smaller venues located there. Bear in mind as you listen to this album that you are probably being short changed a bit, although you won’t notice let alone mind. There are no recordings of those late night jam sessions anyway, so this is about as close as you will ever get to hearing them. The tracks contained on this disc run from “We the Cats Shall Hep You”; 2 different versions; “Russian Lullaby” by Irving Berlin. “Lamar’s Boogie” and “Everyone Eats When They Come to My House “are two fantastic numbers which will have you swinging from the very first bars. “Afternoon Moon” by Duke Ellington gets a wonderful workout at the hands of Cab Calloway, as does “That Old Black Magic”. Even if your only previous knowledge of Cab Calloway is limited to “Minnie the Mooch” or “Reefer Madness” this collection will not disappoint you at all. If anything it will have you listening harder than ever to the unique sounds of one of the “heppest” of the “hep cats” that ever graced a stage. As a matter of fact you don’t even need to be a jazz fan to enjoy this recording. It will swing you.